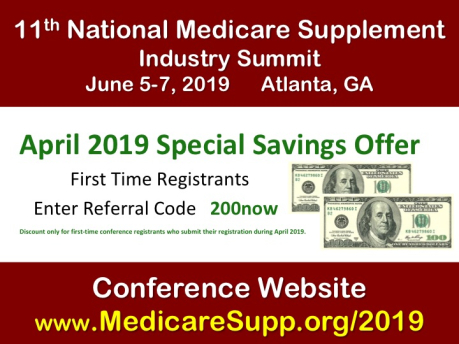 A special discount for first time attendees registering for the 2019 National Medicare Supplement Insurance Summit was announced today by the American Association for Medicare Supplement Insurance. 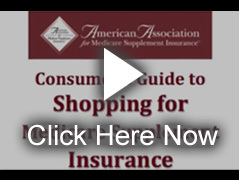 “The Medicare Supplement industry conference brings together over 1,000 industry professionals,” Slome explains. The conference program focuses on topics including MACRA and legislative changes, technology, underwriting, pricing and claims. Over 100 industry experts are featured speakers and some 90 companies are sponsors and exhibitors at the event. To take advantage of the Association’s April promotion, visit the conference website and enter the 200now in the Referral Code field when completing the online registration. The discount applies to new registrations entered in April. 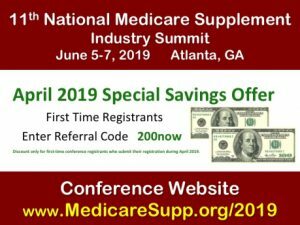 Conference details can be accessed via the Association’s website at www.medicaresupp.org/medicare-conference-convention/.